...But I drew this little guy months ago, and I really want to share him with you! Greetings from Krampus! As much as I love Christmas I think it's super fun to creepy-fy it sometimes. 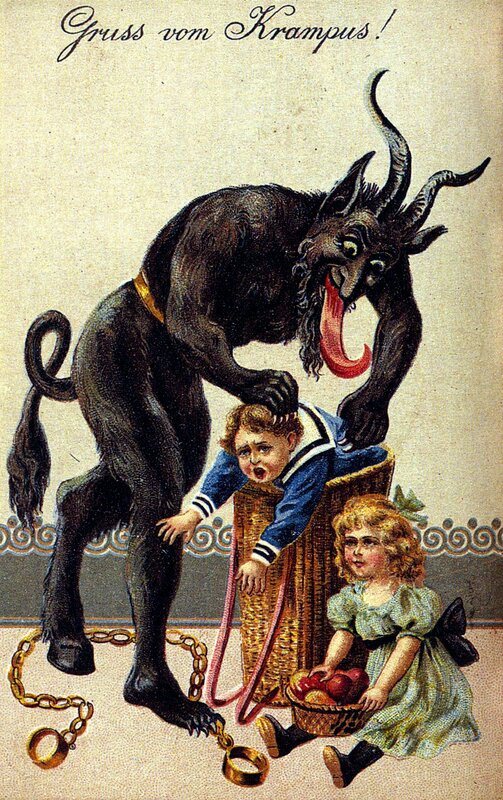 But looking at vintage ads and artwork featuring Krampus, it's positively nightmare fuel! I didn't want to do that for my own drawing, so I came up with this cute liddle guy. Wrapping paper is something new that I decided to try out this year. I bought the biggest sheets of paper my printer can fit (which is still not too terribly huge, but you can still wrap small boxes with it!) and covered them in little mini Krampuses (and also Tentacles, here!). Krampus cards are available as singles, and also packs of four. Wrapping paper is sold as a pack of six. Pick some up, and send the coolest looking presents to friends, coworkers, uptight relatives, everyone!